DEAR LORRIE: Roof leaks of any type cause lots of anguish. It can be especially distressing when there appears to be no obvious cause. The good news is the solution to the problem is very simple. I doubt that you need a new roof. Typically the problem can be traced to a rookie roofer who made one or more basic mistakes. I have investigated hundreds of roof leaks for homeowners. Ninety-five percent of the time, the cause of the leak, as stated in my autopsy report, is centered around roof flashings. A flashing is a transitional roofing material that connects the roof material to some other building material or to another part of the roof. In your case, your valley may have a metal valley flashing or even a granular asphalt sheet that takes the place of traditional metal valley flashing material. In other parts of the nation, many roofers actually weave shingles together in valleys. This weaving method appeals the least to me, since a hollow spot is created under the shingles. Any significant weight placed on the shingles in this area can lead to cracking and tears. This never happens when metal valley flashings are used. The most common cause of a roof leak where metal flashings are used is shingles that have been improperly cut. When a shingle from either roof intersects and passes over the metal valley flashing it needs to be cut at an angle. The resulting cut is very similar to the angle you might see on the tip of a wood chisel. This first cut, which parallels the center line of the valley, forms an acute angle. As a homeowner, you never see the cut at the top of the shingle where this troublesome tip is located because the next shingle row covers it. This is why your roof looks okay. But wind-blown rain or water that crashes up against the edges of the cut shingles in a valley during a heavy rain can readily find this shingle tip. If water does contact this tip that lurks just under the shingle above, the water can flow across the top edge of the shingle until it finds a place to drop down into the home. 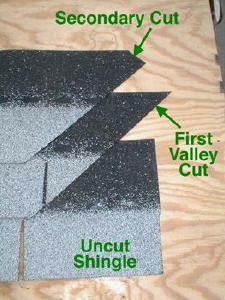 To prevent these leaks, a secondary cut needs to be made at the top of each shingle that is in the valley. The acute tip is transformed into an arrow point by clipping off the tip of the shingle. This simple cut rejects water that tries to flow across the top of the shingle. The secondary cut places the tip of the shingle lower on the valley and water that wants to flow along the top of the shingles must first go uphill to do so. Gravity works very well to win this battle. If you inspect your shingles and find that the secondary cut is missing, you can simply make the cut without removing any shingles. Separate the shingles from one another in the valley and use a tin snips to clip off the tip of the each shingle. Avoid repairing roof leaks yourself! Find a professional using my Roofing Replacement / Repair Checklist. I offer a 100% Money Back Guarantee. When the roofer showed up to install the roof, there are several things he could have done as extra insurance against leaks. Two strips of 30 pound felt paper could have been run down the valley before the metal valley was installed. This felt should go under any valley system.With some effort, this felt paper can be installed under the existing shingles. Ice dam and wind-blown rain membranes can also be installed under valleys. These are very good leak-prevention products. If your roofer had access to a metal brake that bends metal, he could also have hemmed the edges of the metal valley that are hidden by the shingles. Hemming an edge simply means folding it back on itself. The hem is about one half inch wide and folds up and over to a nearly 180 degree angle. An air gap of approximately one eighth remains between the bent piece of valley and the main body of metal. As water tries to flow to the edge of the metal valley, it is captured by the hem and redirected to the bottom of the valley flashing where it flows into the gutter.